The subject of elevators has, throughout the past few years, been addressed many times on this page. Previous writers, however, have confined most of their harangues to the maligned Student Center elevators. Converting one of those two slowpokes to express operations, servicing just the first and fifth floors, “is an idea whose time has come,” declared Anders Hove ’96 on September 27, 1996 [“Student Center Needs Express Elevators”]. 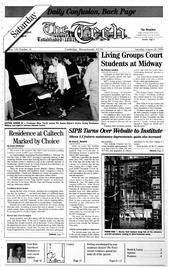 A year and a half later, Naveen Sunkavally ’01 advocated drastic measures to implement the express-elevator idea -- physically disabling buttons “2” through “4” on one of the control panels [“Student Center Express,” March 10, 1998]. I will briefly mention the lethargic Student Center elevators. However bad as you may think them now, they were, not too long ago, far worse. The “close-door” buttons weren’t installed until recently; even though they don’t work too well, it’s far more satisfying to be able to push something than it is to simply have to stand and wait for the doors to close. Around the corner from the two passenger elevators, across from the Coop store on the ground floor, is the far more interesting Student Center freight elevator. This massive device, little used by students, has a suitably monstrous portcullis and makes agreeable clanking noises as it trundles along. Across Mass. Ave. are the main Infinite Corridor elevators -- the one in Lobby 7 and the two in Lobby 10. These, however, are less interesting than other elevators in the main academic complex that attract scant attention. The Rotch Library elevator, tucked away in Building 7, is futuristic in appearance but an unbelievably slow mover. The Building 3 passenger lift, like that in Rotch, has a single-pocket door, but seems to be concerned less with appearance. Makes sense; the Rotch elevator is used mostly by bespectacled architecture-and-planning library types, while the Course 2ers in Building 3 are often carrying interesting machinery in place of books. There’s also a Building 3 freight elevator at the other end of the building; it’s similar to, but smaller than, its Student Center counterpart. The bizarre little elevator in Building 8 travels only from the third floor to the basement of Building 16, with stops along the way at the first and second floors of the Infinite Corridor. Its purpose is to create wheelchair-accessible connections between Buildings 8 and 16, which, except on their fourth and fifth floors, respectively, are separated by stairs. A product of the Building 16 renovations, this little elevator would seem to have the highest ratio of doors to travel distance of any elevator on campus. The nearby elevators in Building 16 were also spruced up during recent renovations, but do not in my eyes compare at all to the speedy, no-nonsense elevators in Building 56, across from the Athena cluster. The two Building 56 lifts are everything elevators should be, and certainly the best on campus. They’re fast, they’re responsive (if you press “door close,” the doors immediately snap shut), and they’re well-designed -- two of the only elevators on campus to have duplicate interior control panels, one on each side of the door. A pair of elevators is located in Building 9, but can’t be accessed except by a short flight of stairs leading to Lobby 7. This arrangement is surely one of the most peculiar stair/elevator pairings on campus. In contrast, the wheelchair lift at the Building 1 exit to Mass. Ave. was installed specifically to solve an access problem. Building 66 is home to one of the most peculiar elevators on campus. The floor display isn’t on a separate metal plate; it simply appears above the door as if it was a design oversight. Furthermore, this elevator goes all the way down to 66’s subbasement, a truly frightening environment in which can often be found the most unusual sorts of discarded equipment. A Building 66 freight elevator is visible from the subbasement, but it’s cloaked in mystery and no facts could be obtained about it by press time. Let’s backtrack a bit to Building 6, which has two strange elevators whose outer doors must be manually swung open. Scavengers scuttling back to their dorms with IBM XTs found in the basement, take note: these elevators are for passengers only. No freight! Finally, those interested in taking a long, long elevator ride will probably want to end their macabre tour of campus lifts by visiting Building 54, the infamous Green Building. Just remember, there’s a $500 fine for riding the elevator to the top floor and then busting out onto the roof. Other intriguing elevators can be found on the fringes of campus. East Campus has a teensy elevator that shuttles between the basement and the first floor of the east parallel. The MIT Press building, or some building around there, has a freight elevator that does the Student Center’s one better with its manual control. Buildings 13 and 34 have huge passenger elevators, and a hidden lift is tucked away in a dark corner of Walker, providing access to Pritchett on the upper floor. And there are probably some not-on-the-blueprints elevators scattered around, connecting steam tunnels to secret passages. Explore -- bring your spelunker’s helmet.